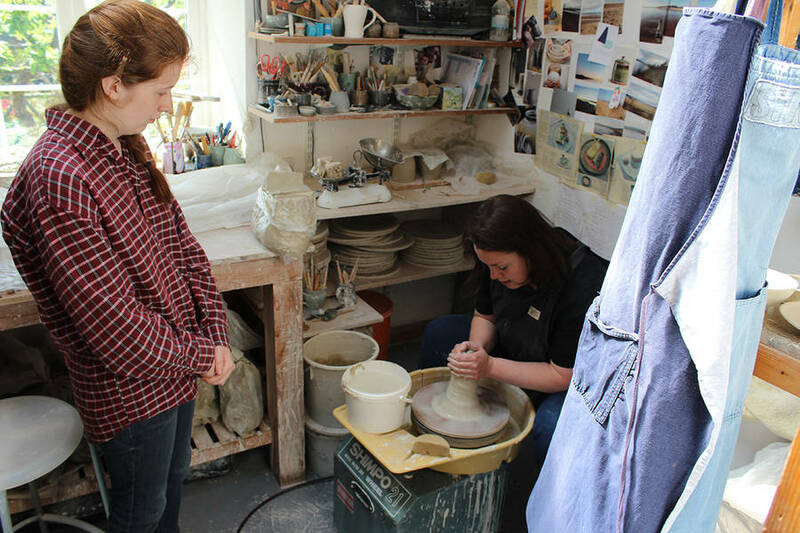 On Thursday we travelled to Clare Dawdry's studio in Kirkpatrick Durham. Her studio is at the back of her pottery shop, which was full of her pots in preparation for the upcoming Spring Fling. She talked to us about her practice since graduating from art school and how she had learnt over the years the importance of having good photographs of your own work! She makes stoneware pots in two kinds of clay and fires them in reduction in a gas kiln. When the flames are starved of oxygen in the air, they turn to the oxygen in the glazes to feed them, resulting in a different colour palette. Clare demonstrated how she makes the handles for her pots and we practiced attaching these ribbon-like strips onto different shaped vessels Clare had thrown for us. We learnt the basics of how to throw a plate and practiced trimming the base on plates Clare had thrown for us the day before.